Derek Foster, Baron Foster of Bishop Auckland, PC, DL (25 June 1937 – 5 January 2019) was the British member of Parliament for Bishop Auckland, County Durham from 1979 to 2005. He was a member of the Labour Party. Foster was first elected to represent Bishop Auckland at the 1979 general election, and held this seat until his retirement in 2005. He served as opposition Chief Whip between 1985 and 1995, becoming a member of the Privy Council in 1993. After Tony Blair became leader in 1994, he was keen to appoint a new Chief Whip and asked Foster to stand aside, in return for the promise of a seat in the Cabinet if and when Labour returned to power. Foster eventually agreed and became Shadow Chancellor of the Duchy of Lancaster in 1995. However, when Labour won the 1997 election, Foster was appointed to the relatively junior role of Parliamentary Secretary in the Cabinet Office, under David Clark. After giving the matter further thought, Foster stood down from the government after just two days, and later publicly accused Mr Blair of having broken his promise to him. He was eventually appointed chair of the Commons sub-committee on employment, becoming something of a thorn in the Government's side during Mr Blair's first term. However, the employment sub-committee was abolished in 2001 and he became a backbencher, retiring from the Commons at the 2005 general election. He was appointed as a Deputy Lieutenant of County Durham in 2001, giving him the Post Nominal Letters "DL" for Life. On 13 May 2005 it was announced that he would be created a life peer, and in June 2005 the peerage was gazetted as Baron Foster of Bishop Auckland, of Bishop Auckland in the County of Durham. He died on 5 January 2019 at the age of 81 from cancer. Foster also had associations with The Salvation Army, serving at the Sunderland Millfield Corps, whilst also a member of the Labour Friends of Israel Policy Council. 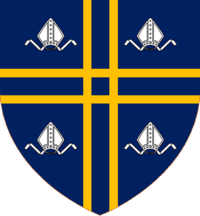 The association of Durham with a gold cross on an Azure field is featured in a varied form in the Arms. The cross formation is placed between four mitres as a punning allusion on Bishop Auckland. Punning on Bishop Auckland is also extended into the Crest. In addition to being an industrious animal, the otter is associated with rivers and Bishop Auckland is sited on the River Wear. It is depicted in association with trumpets as the grantee has a particular interest in brass bands. ^ a b "Lord Foster dies at 81 - Corbyn leads tributes". The Northern Echo. Retrieved 7 January 2019. This page was last edited on 10 February 2019, at 03:06 (UTC).